An interview with the author of a book with a most unique plot. Shruti Johri’s Book Her Master Key. 1: If you were to change your genre, which one would you choose? A drama based on my parenting experiences. If someone yields the power to distract the passionate ‘hotelier’ in me, it is the ‘mother’. My personal blog is a live record of my maternal ordeals. 2: What does literary success look like to you? Being a change agent! It could be on a modest scale. 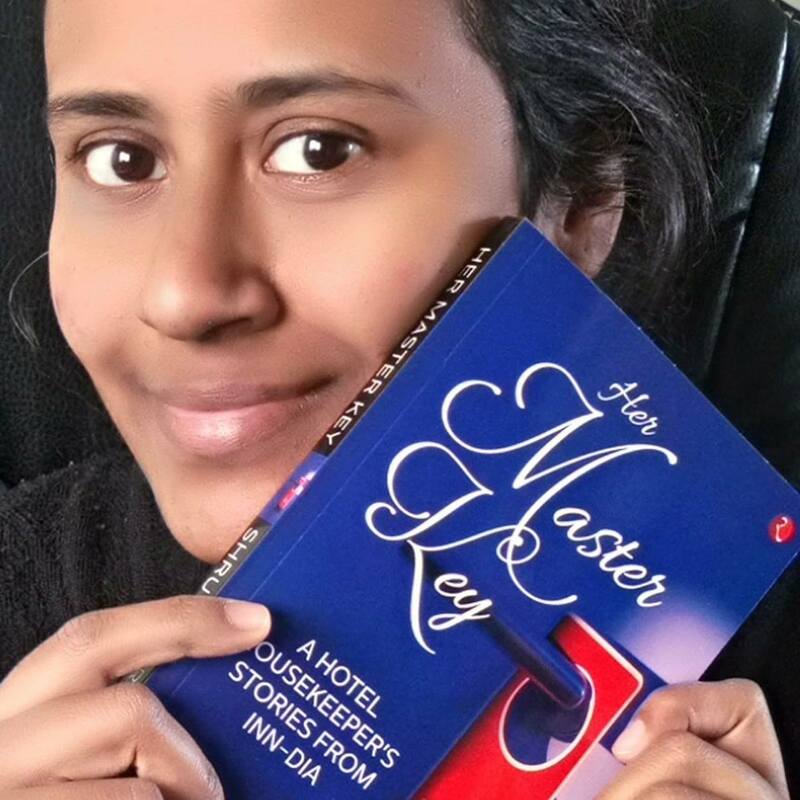 With the launch of ‘Her Master Key’, I see tremendous hope in building awareness and sensitizing travellers towards the hard work put in by the hotel staff. Compassion towards services has been long overdue in our country, where the unfailing characteristic of the remnant feudalism mistakes ‘services’ for ‘servitude’. 3: What are your hobbies, passion other than writing? ‘Eddie the Eagle’ – The story of Eddie Edwards, who during the 1988 Winter Olympics, competed in and finished last in both the 70 m and 90 m events. He charmed the world at the 1988 Winter Olympics. His lack of success endeared him to people around the globe. ‘Florence Foster Jenkins’ – Based on true events, the plot revolves around a New York heiress with dreams of becoming an opera singer, though she has a terrible singing voice. Apart from films, I also love singing to some old tunes from Hindi films, especially the ones from the 1950’s to 1980’s. 4: How did it feel when your first book got published? What is your motivation for writing more? I was thrilled about the work finally getting accepted. Akin to a child winning close friends after moving uptown. It was tough to sell the story of a humble hotel housekeeper. After facing a series of rejections for more than a year, I turned numb to both positive and negative replies about the publishing queries. Call it the coping mechanism! It took me more than a week to come to terms with the fact that the manuscript had indeed been picked up by one of the leading book publishers in India. But, I remain grateful for the constructive feedback that few commissioning editors provided despite rejecting the manuscript. It helped in shaping up the book tremendously. As I said earlier, the possibility of being able to create an agent of change pushes me to write more. If my writing seems capable of breaking a few myths and stereotypes, I could go on! 5: Do you pen down revelations and ideas as you get them, right then and there? Oh yes! At times I even use my cell phone to voice record ideas and observations before I lose the chain of thoughts. I’m quite easily distracted, especially by my four year old daughter. 6: Although all books say that all the characters in the book aren’t real or related, but are they really all fictional and made up? Have you ever written a character based on the real you in some part? Yes, I may have created certain characters bearing a part of me. But never in entirety. It is not rare to come across authors confessing that their stories emanate from their own experiences or at least someone close to them. 7: What other genres do you enjoy reading? I enjoy reading drama, self-help & spirituality and children’s literature including Amar Chitra Katha. I am passionate about topics related to parenting, having read about some contrasting ideologies on the subject like the concept of ‘free childhood’ from the book SUMMERHILL by A. S. Neill and the idea of disciplined parenting for raising successful kids from the book BATTLE HYMN OF THE TIGER MOTHER by Amy Chua. 8: Can you tell us about your current projects? I am currently working on the sequel to my first book, unearthing deeper stories from the vibrant setup of Indian hotels. This would also be an attempt to incorporate the feedback coming from book reviewers and readers. On the work front, I am a qualified Instructional Designer creating learning materials for various age groups including e-learning modules along with undertaking scoping studies for development banks.